Well, I have been knitting a little but I don't have any pictures. I'm working on a new felted bag pattern and the first try didn't turn out as planned. On top of that I have had a nasty cold that kept me down for a few days. I'm getting better, but I'm oh so tired. There are new pictures to look at in the Booga Bag gallery though! Thanks again to everyone who has sent pictures. If you want to see what almost any color of Kureyon looks like post felting -- browse the gallery! Maddie's birthday was yesterday. 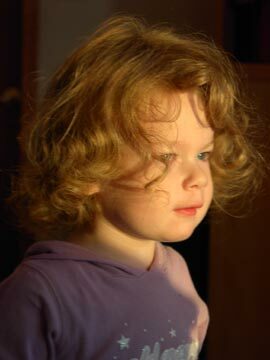 I can't believe that she is three! I have been knitting, really I have. I'm working on a new felted bag pattern (go figure), and It's not ready yet. So, today I just want to say thanks again to the guys at ThreadBear for encouraging me to release my first pattern for sale. And I want to wish them a fun and successful grand opening. Congratulations Rob & Matt!! I have a new felted bag pattern! I call it the Madeleine Bag, and it will soon be available at ThreadBear. In fact, if you are there this weekend for their grand opening, you will be able to see the models in person. I have also started a new website for my new business -- Black Sheep Bags. I just want to say a huge THANK YOU!!! to everyone who visits my blog and has made my Booga Bag. I was so flattered and encouraged by all your nice comments. Without all your kind words, I would never have thought that I could design anything that anyone would want to knit. I think that starting a knitting blog and meeting other knitters online has been one of the best things that I have done for myself (and my self-confidence) in a long time. Thanks again! I'm on a roll with the socks. Finished mine Friday and started these for Maddie on Saturday. Kids socks are *so* quick to knit! 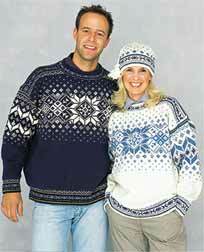 But I really have my eye on Jubileum from the Dale of Norway Heilo 60th Anniversary book. Wendy made this sweater and you can see it in her gallery (along with lots of other cool stuff!) I can *not* find this book though! If anyone out there has a copy they want to sell, or knows of someone who has it for sale, *please* let me know. I spent over an hour searching the web for this book to no avail. TIA! Not sure why it took me so long to finish these socks. Guess I just lost interest over the summer. This is exactly why I keep a knitting blog. 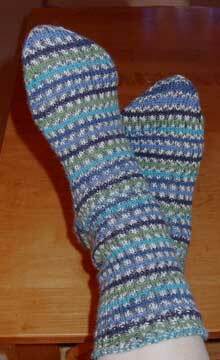 I finished the first sock quite a while ago. When I picked up the second skein, I had no idea what pattern, cast-on, needle size, etc. that I had used. All I had to do was take a quick peek at my WIP page and there was all the info I needed. Quite handy! What's next? Maybe a pair of socks for Maddie. Kids socks are so quick! Yep, I think I'll start Maddie's socks tomorrow. Wow! There are now over 300 blogs in the Knitting Blogs Web Ring. Oh yeah -- and I have been knitting. The washer is full of felted bags right now. They should be dry and ready for viewing in a couple of days. Thanks to Mandy over at Yarnageddon for giving me the how to on Irlandais. I ordered it right through the Phildar site by clicking on "Commander ce catalogue" at the bottom of the page. Even though I know very little French, I made it through the checkout easily. And it was less than 9 euros (about $10). Thanks to everyone who helped me out in my quest! !